Situated less than 10 minutes’ walk from Oban’s famous McCaig’s Tower, The Ranald Hotel is set in the heart of Oban town centre and just off the main esplanade. 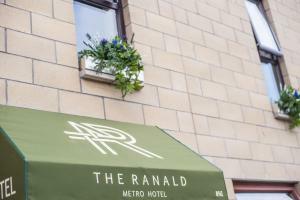 Free Wi-Fi, an en suite shower room and a flat-screen TV are featured in each room at The Ranald, as well as iPhone docking stations and tea/coffee making facilities. Freshly brewed coffee, warm Scottish pancakes and baked eggs are served at breakfast, as well as smoked salmon and cream cheese bagels. Scenic wildlife cruises can be taken from opposite the Oban War & Peace Museum, which is a 5-minute drive away. Diving, fishing and kayaking can also be enjoyed in the local area, and Dunollie House and Castle are just 1.3 miles away.